Marine Corps Rings for Men are designed to record and celebrate a career in the United States Marines. Whenever you see a man or woman in a Marine Corps uniform it’s easy to see how proud and dedicated they are. The have undergone intense physical and mental training to achieve their current status. Marines live by codes and are willing to sacrifice their lives for fellow Marines and their country. This is an enduring fact and one a Marine is very proud of. Marines have been wearing rings to display their pride and in many cases to document the service they have provided to their country for many years. Virtually every Marine Corp Ring for men will have one thing in common, and that is the Eagle, Globe, and Anchor. In one way or another, this has been the emblem of the Marines since the beginning. It has gone through many variations over the years but never discarded. This has become the symbol, in some variation, of nearly all Marine units in other countries as well. The globe of the US Marines depicts the western hemisphere while the Royal Marines of Britain have the eastern hemisphere. The Eagle represents our country, the Globe tells us Marines serve in any part of the world, and the Fouled Anchor, illustrated by the rope wound around it, symbolizes the Naval traditions still prevalent today. Many Marines will tell you that the fouled anchor also means that even though they serve on Naval vessels they are not sailors. In addition to the Eagle, Globe, and Anchor many rings may showcase a particular regiment or battalion, a specific military operation, or a decoration or medal earned. 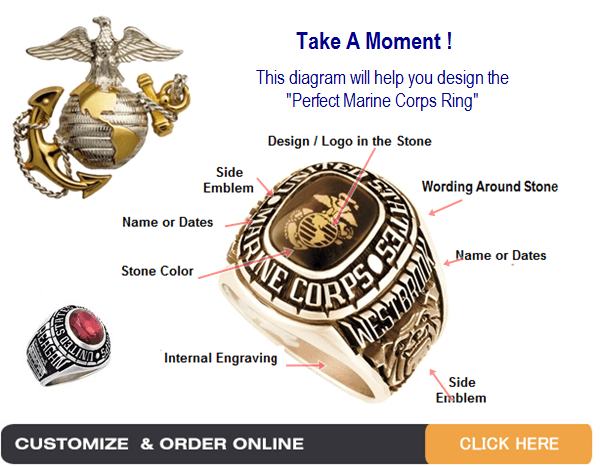 Marine Corps rings for men may be elaborate like a class ring or simple with just the emblem engraved on the top. The stone could be a birthstone or a stone denoting another memorable date in a Marines life or career. The sides can be customized to reflect the unit he or she is attached to, a symbol of a military campaign, a piece of equipment, or a particular phrase such as the Marine Corps motto “Semper Fidelis” meaning Always Faithful. Faithful to the mission at hand, to each other, to the Corps, and to the country, no matter what. 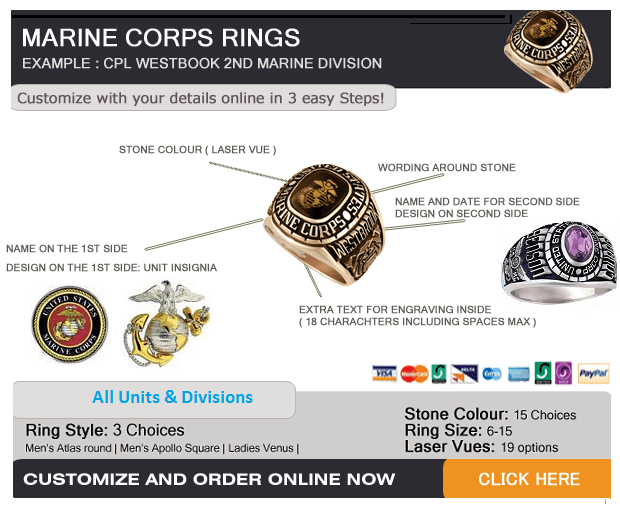 The inside of Marine Corps rings for men may be customized as also. In most cases, it will be engraved with the motto “Semper Fidelis” or “Semper Fi”. It could also be their enlistment date, anniversary, or anything that is pertinent to the individual wearing or giving the ring. Rings have been used to represent significant events, graduations, memberships, or anything that is celebrated in our lives. Marine Corps rings for men are no different. Many retired Marines will pass their rings down to a son or daughter as they continue in their footsteps and they in turn may pass it down to their new Marine. If you are ever in doubt what to give your Marine, a ring symbolizing their Marine Corps years will always be appreciated.